Satellites Who was St. Arnold? 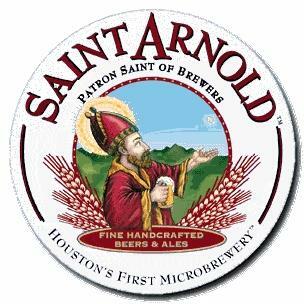 St. Arnold is the patron saint of brewers. A monk from a military order, he came from Tiegem, near Oudenaarde, and lived from 1040 to 1087. He became famous as the knight "Arnulph the Strong of Oudenaarde". Later, he became a Benedictine monk and founded the Abbey of St. Peter in Oudenburg, where he began to brew beer due to the impurity of the drinking water. 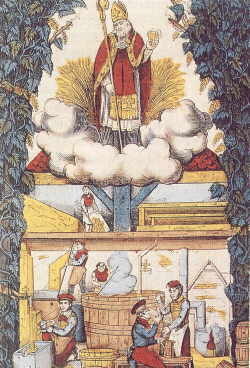 There are many depictions of St. Arnold with a mashing rake in his hand. Various miracles are also ascribed to him. A confessor in the court of Charlemagne. Arnold was a Greek by birth, entering the service of Charlemagne. He was noted for his charity to the poor. A village, Amold-Villiers, was named after him, near Jülich. A well balanced, full flavored, amber ale. It has a rich, malty body with a pleasant caramel character. hints of chocolate, a touch of sweetness and a light hop flavor. 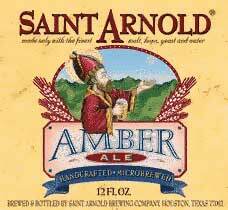 A rich, hearty ale perfect for the holiday season with a malty sweetness and spicy hop charachter. drink one of the mass produced beers, reach for this "fancy" lawnmower beer. 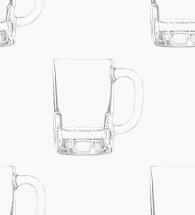 A refreshing, flavorful filtered wheat beer. The perfect beer to accompany a meal or for a summer's day. The wheat contributes a lighter flavor while maintaining a rich body. The beer has a light hop profile -- just enough to give the beer balance and complexity. This strong, malty lager has been aged to create a smooth, slightly sweet taste with round notes of caramel. Not a bad triple. Good head, and Duvel-like colour. Nice balance of hop and yeast. Fruity and spicy. 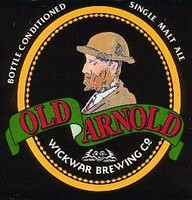 Old Arnold is brewed using 100% finest English malted barley and subtle blends of whole Fuggle and Challenger hops. complemented by an abundant hop aroma and flavor. flavors and a well balanced soft roastness.